President Shai Reshef's Blog | Because education should be a right, not a privilege. President Reshef Meets UoPeople Student at 2013 CGI U! University of the People is honored to have a long standing relationship with the Clinton Global Initiative (CGI), a forum which brings together world leaders, turning ideas into actions which change the world. In 2010 President Reshef announced at the CGI Annual Meeting, UoPeople’s commitment to educate 250 Haitians for free. This month, on April 18th, 19th, and 20th, President Reshef will be in Haiti to announce the unveiling of 150 new scholarships for additional Haitian students, as UoPeople has fulfilled 100 scholarships to date. (Check back for more info on President Reshef’s upcoming Haiti trip). 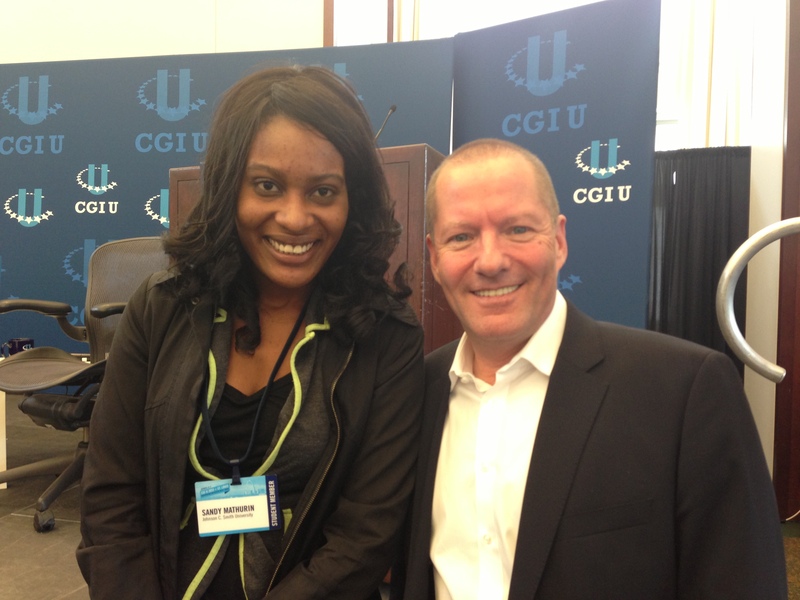 At the CGI University meeting at Washington University in St. Louis this year, President Reshef met with a current student, Sandy, who was in attendance at the meeting as well (see picture above). President Reshef presented on a panel titled, “Going Digital in Education,” and spoke about the limitations and challenges of technology to open the gates of higher education globally, especially for the most marginalized populations. The Clinton Global Initiative was established in 2005 by President Bill Clinton and annually convenes global leaders to devise and implement innovative solutions to some of the world’s most pressing challenges. President Clinton launched the Clinton Global Initiative University (CGI U) in 2007 to engage the next generation of leaders on college campuses around the world. This is an annual event for undergraduate and graduate students who are developing commitments in their communities and around the world. Throughout the year, and as a prerequisite of attending the CGI U Annual Meeting, students and youth organizations developed their own Commitments to Action: a specific plan of action that addresses a pressing challenge on campus, in the community, or around the world. CGI U is proof that young people have the power to make a significant impact by confronting some of the world’s most urgent challenges. University of the People is proud to have been a part of this important meeting. There is a lot of hype surrounding MOOCs (Massive Open Online Courses), as there should be. Knowledge at ones fingertips has never been more readily available to everyone. Especially for individuals looking to take a course from a renowned professor, or professionals looking to enhance their skill-set in a particular area – MOOCs are great. However, there are some limitations to MOOCs and much confusion surrounding them. First and foremost, at this point in time, MOOCs offer courses and not degree programs. So, one could not attain an undergraduate degree in Business Administration, for example, from taking a scattering of MOOC courses. What a person could attain though, is a brush up course in marketing, or accounting. 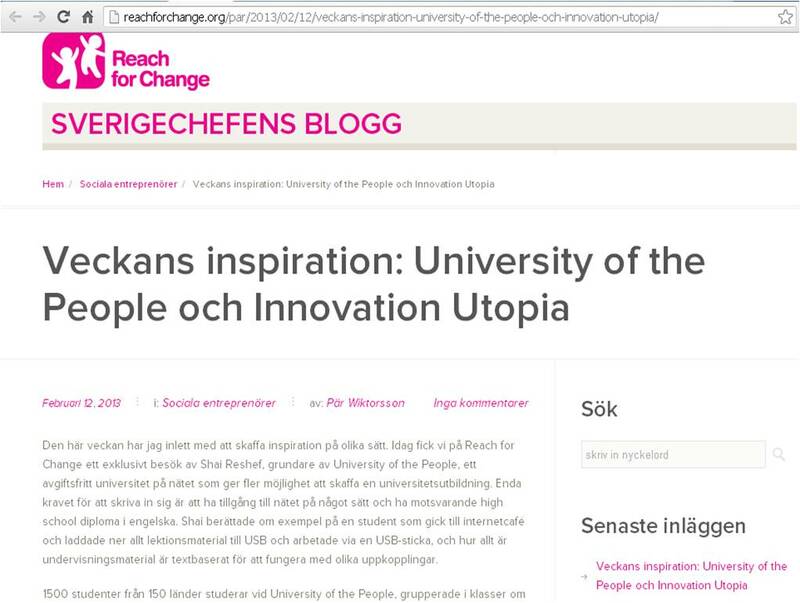 For those who wish to undertake and complete an entire undergraduate degree program, tuition-free, MOOCs are not the current solution – University of the People (UoPeople), is. University of the People is the world’s first tuition-free, non-profit, online, degree-granting university dedicated to opening the gates to higher education for all those otherwise constrained. For those looking for individualized attention, MOOCs are not the right resource. MOOCs are great for self-study learns because there are tens of thousands, sometimes even hundreds of thousands, of students in each MOOC course. Individual MOOC learners should be highly independent. There are no student service or academic affair support offered by MOOCs as they are not a university, they are stand alone courses. Consequently, University of the People breaks its classrooms into 20-30 students, and thus, is able to offer personalized attention from instructors with peer learning. Additionally, University of the People offers a full suite of support services including student support, academic advising and more. Due to the nature of MOOCs being open to thousands in a classroom, and the end goal is knowledge and not a degree, it is inherently natural then that MOOCs have demonstrated 10% or less completion rates per course. Curiosity is intriguing, but sometimes, without support, it is not long-lasting. On the flip side, University of the People demonstrates 85% to 90% completion rates per course, with the end “prize” after taking many courses together, is having obtained an entire undergraduate degree. In conclusion, MOOCs are incredible tools for skill development and knowledge obtainment. However, they are not here to serve individuals who want a degree in a subject but simply cannot afford tuition. University of the People is the vehicle to find the brightest in need of a tuition-free university, and offers business administration and computer science degree programs. University of the People is pleased to share with you the latest engagement efforts of UoPeople President Shai Reshef to reach students in need. 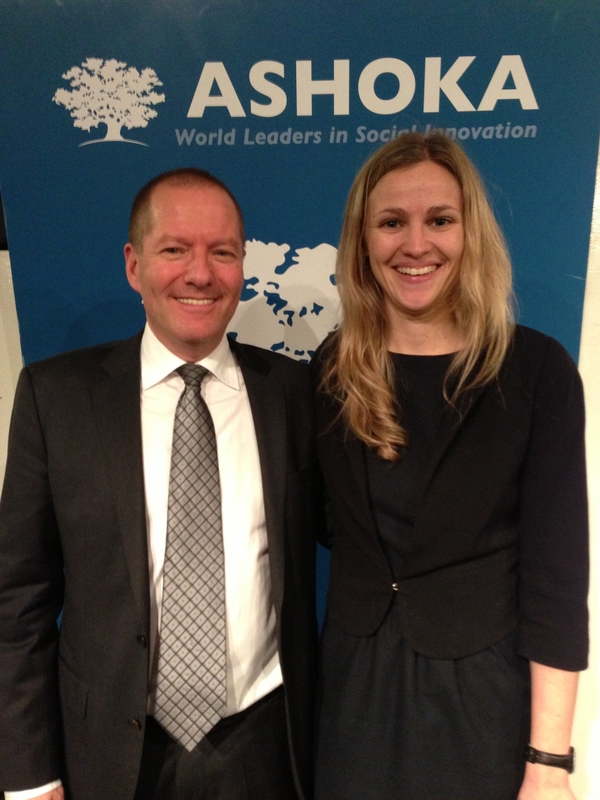 Recently, President Reshef was at the Innovation Utopia event in Stockholm as well as the Ashoka Scandinavia Meeting. 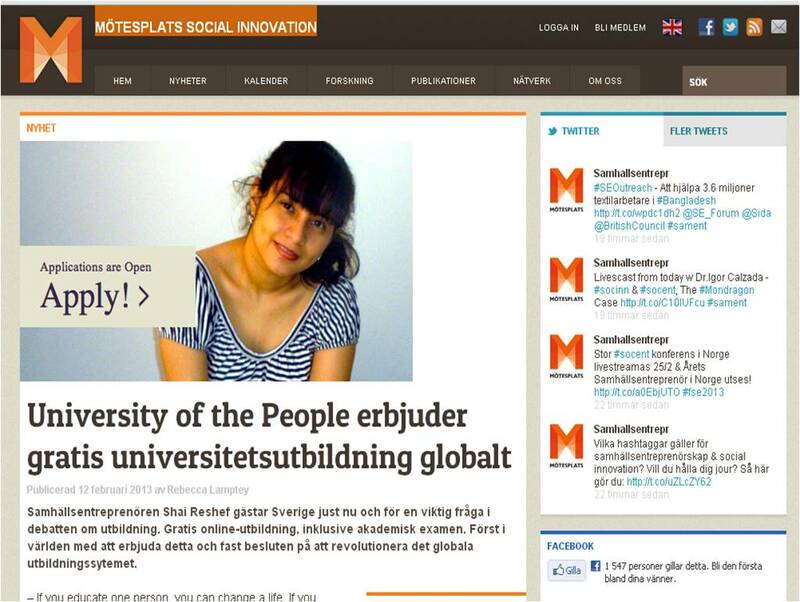 Both were incredible events, with much support for University of the People resulting from the events! UoPeople Upgrades Student Learning Management System! •Completion tracking: This feature will allow students to see which assignments students have completed or viewed. 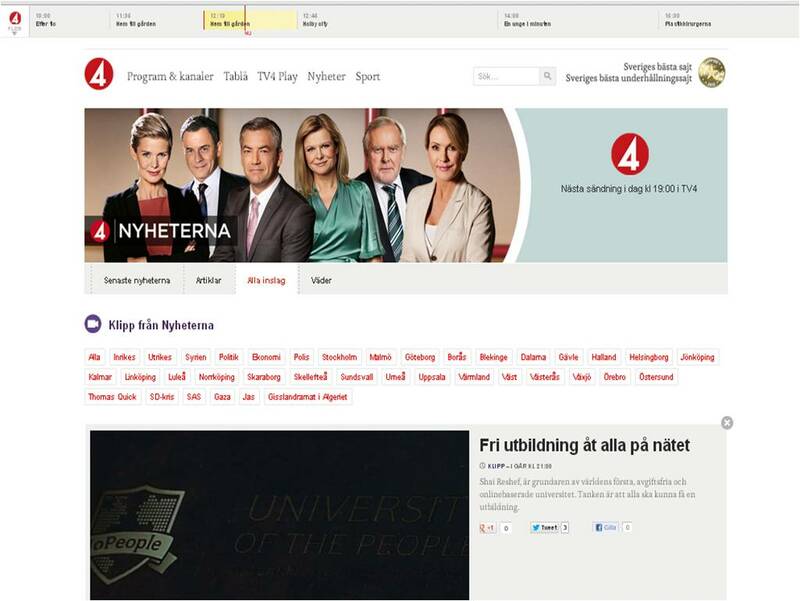 •Mobile View: This feature presents an interface optimized for mobile devices such as smart phones and tablets. •Editor: The Moodle editor has been completely updated with a more advanced and easy-to-use editor. UoPeople looks forward to continuously improving the management systems of the University to ensure a pleasant and efficient quality learning experience for all our students. Have you ever wondered about UoPeople’s tuition-free education? Have you been curious about how to apply? How long it takes to apply? Is the IELTS or TOEFL required? What is the Accelerated English program? What qualifies you for admission? What is the grant provided for the application processing fee for your country? What are the scholarship opportunities at UoPeople? When does the next semester start? Before enrolling in a university, there are numerous details to investigate. Luckily, UoPeople is having an Open House where all your questions will be answered! The event will take place at http://www.facebook.com/events/130079757157206/ and runs throughout the 24 hour period on Wednesday, January 23rd, 2013. UoPeople’s Admissions Team will be available to explain and answer all questions throughout this period. This Wednesday, join UoPeople for our Open House and accompany students from 135 countries that have already asked about UoPeople and enrolled — and are now enjoying the opportunity of tuition-free education! UoPeople welcomes applicants and students from around the world. Take the next step forward to a better future by discovering the reality of tuition-free education! Rapidly approaching is the anniversary of the Haitian earthquake of 2010. This catastrophic event on January 12th claimed 316,000 lives and the homes of 1,000,000 victims. The destruction from the earthquake was cataclysmic in every way possible. The event can be glossed over as a problem of the past, but this is not the reality. Haiti is still deeply affected by the calamity. The well-being and development of the entire country was immobilized. 28 of 32 universities were completely destroyed, the education of the future generation was hindered, and the brightest and most skilled youth fled in search of better outcomes for their futures. The voids left in Haitian society were sizable. The earthquake, and cholera outbreak that followed soon after, left a desolate country, physically, mentally, and in terms of hope of the entire population. Haiti became dependent on the generosity of others. Food, water, all kinds of relief flowed in, but these aids were temporary, not long-lasting. The true rebuilding had to come from with-in. UoPeople recognized the necessity of a long-term, liberating solution. We have fostered hope through giving access to tuition-free higher education to Haitians – almost 100 have been admitted to date. These students were given the gift and responsibility of leading their nation in the upward climb of rehabilitation and rejuvenation. The ability to develop pertinent skills is allowing these students the empowerment to help themselves and their beloved country — improving the future of Haiti. 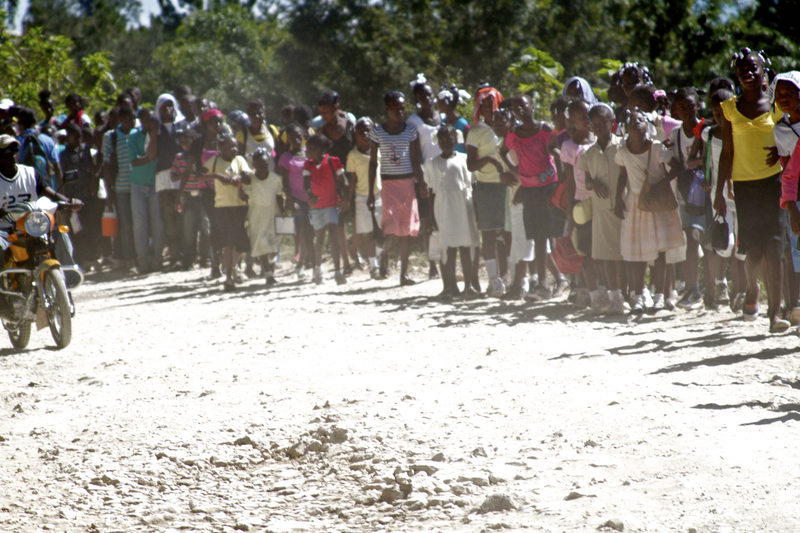 UoPeople recognized education as the key to replenishing and reviving Haiti. These new educated young leaders promise a bright future to the entire country. Haiti will be independent and economically viable once again. On the anniversary of the earthquake, UoPeople is commemorating and continuing their efforts to educate more leaders and invest in the future of the entire country. Online education is quickly becoming the new form of learning. In the past ten years, online courses and programs have increasingly been developed and are continuously progressing in traditional and innovative academic programs alike. Based on Babson’s Survey Research, it has been shown that the mindset of many top educators is moving towards acknowledging online courses as the wave of the future. In 2003, Babson performed a study and slightly more than half of academic leaders agreed that online education was equal or superior to in-person classes. In less than a decade, more than three-quarters, 77%, began acknowledging the benefits of online learning. In fact, nearly 7 in 10 academic leaders concurred that including online learning is an integral part of their future plans. Already, more than 7 in 10 colleges are equipped with full academic programs online. Private nonprofit colleges have embraced online education with almost half offering fully online programs. This mode of learning is the new trend endorsed by academic leaders and students. More than 6.7 million, or a third, of students in postsecondary education took an online course in fall 2011. Even as enrollment in universities fell in 2011, students enrolled in online courses continued to increase. From these statistics, it shows that students endorse online learning as a successful mode of learning compatible to their learning styles and needs. Online education is steadily increasing in popularity and endorsement for those providing and those receiving post-secondary education. As Babson has been studying and analyzing over the years, despite the hesitations of initial critics, they have found that support is increasing for online learning, which seems to be successful and persisting. Overall, those in education have begun to recognize online courses as beneficial and worthy as a means of education. UoPeople is extremely pleased with this growing trend and support. We recognize online education as having huge benefits for traditional students, along with those who are constrained financially, physically, and geographically. This form of education allows accessibility to learning and is the great equalizer for all who desire education. Online education is an improved mode of learning that will allow those all over the world to benefit from education, reach their dreams, and change the world. With time and great effort, online education is finally becoming recognized as the gem that it is.